I do not know how in the world I came across your blog but WOW , I feel so blessed! you are amazing. I have watched several of your videos and have learned so much! Thank you!!!! Sandy, both of your cards are adorable. I love the precious scenes you created with the images. Especially love the bear and the seagull. What fun and how creative you are!!! Love both cards. I so admire your painting ability. You make it look effortless. I have a sock monkey that my great grandma made me when I was a baby (now I’m 47) its in pristine condition. I kept it wrapped in thick bisquin. Great texture I guess I’d call it.The lines really pop him.I love the second to but really love the monkey. Amazing cards!! I love all the bright colours! I love to watch you color. You make it look so easy. Your work is simply amazing, Sandy! I’m always blown over by it & these cards are no exception. Your Copic coloring skills are something I could only hope to begin to achieve. However your painting skills never in a million years! That’s okay though. You have been blessed with these talents & you share them with us. Love this new release! Oh, a sock monkey holding his own little bun… how adorable! I love that fantabulous scene at the beach!! Super cute cards!! I was hoping someone would do a card with the sock monkey, he is so cute. Oh your Mr Bear is divine! Love, love, love him!! Super cute cards Sandy. Love the coloring on sock monkey! Ah-mazing! Love your bear at the beach card and knitted sock monkey. You always do something inventive. So very Awesome cards!! 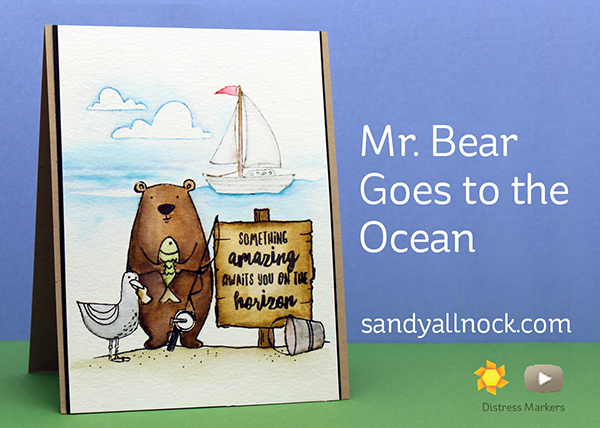 I love Mr Bear – that is the cutest card! Love watching you color these adorable images! I learn something everytime I watch you. You might have said it 20 times already but forwhatever reason it finally “clicks”. As always, your coloring is fantastic. Love this release. I love your bear card! That seagull cracks me up. So cute! You’re coloring skills are amazing! Love what you did with these new stamps! Beautiful job with your cards. I’m loving the new mondo peony stamp and die / I’m just a sucker for flowers! Your cards and talent are alwsys so fun to see. Im so happy you used the distress pens for your second card. I havent pulled mine out in awhile and now its time. TY for sharing and as always giving helpful hints. Adorable, but especially that sock monkey one! ❤️ Mr Bear – just the name reminds me of one of my favourite book series as a child It was called Mr Bear too! OMG…what wonderful tutorials…I could sit here all day and watch you color. Love Mr. Bear! so creative! That sock monkey is so darn cute!! The card is perfect!!! 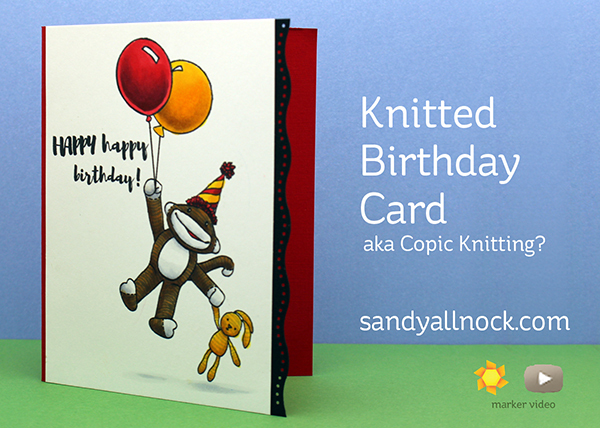 I love both your cards Sandy the sock monkey is adorable, and the bear scene is wonderful, both fantastic cards. Such adorable cards! Fabulous job of coloring on both! Very cute cards. I like how you achieved the knitted look on the sock monkey. Love your cards! They’re both super! Love the bear and salty sayings! Too cute! I love the bears card, and the Stay Salty stamp set is super cute! Love your work, and am always in awe! Both cards are adorable. Brought back memories of my own sock monkey. Thanks for the memory! The sock monkey is adorable. Love the bold colors. I think my little God-son would love to receive that card. Thanks for the tutorial! great job,love the scallop border idea. I must try that! The bear at the beach captured my heart. Adorable cards with wonderful inspiration! these are so darling!! Sock Monkey! I love Sock Monkey!! Oh be still my soul!! This release is amazing! Gotta have it all…as I can! You always inspire me so very much, Sandy! Thank you! Love, love these two cards. You are amazing! Thank you Sandy for the inspiration that I got from the second video watercolor aspect . I learn so much regarding color, shading, and techniques . I also appreciate when you make an occasional mistake, because then there is always a way to either fix it , or maybe even begin again! No shame . Thanks! Wonderful coloring as usual. You make it look so easy. You have a super talent. 😀 😀 I’m so glad I bought the stay salty, all inside and bear ware sets!!! Yay…. But if only my Budget allows… I would have gotten the sock monkey one too… Soooooo good luck to meeeee! The first card is so sweet with the scalloped border! But the second, oh my!! I’m so in love with it!! I LOVE the whole scene you created and of course your coloring! !